If I didn't know any better, I'd think I was watching an experimental film and not footage of Space Shuttle Endeavor's last launch. At times, the visuals contained within the 37-plus minutes can only be described as accidentally beautiful. In fact, Cnet pretty much nails that sentiment with their description of the segment which transpires between the 16 and 20 minute marks. 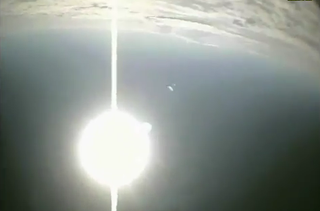 The Earth starts spinning and warping; spiky lens flares streak out from the sun; a trail of smoke from the other lost booster angles across the frame. Then all goes black but for two demonlike eyes of light. A dragon growls. Then: all black. A sudden explosion of light and a raptor's scream. A strange symbol appears and metamorphoses into jellyfish, mushrooms, space flowers, parachutes. A last wrenching clank of sound as a setting sun appears and we splash down into the Atlantic, the parachutes settling into the sea.